Over the past week it has been announced that China plans to phase in regulations that will remove its mandatory animal testing requirements for domestically manufactured cosmetic products. 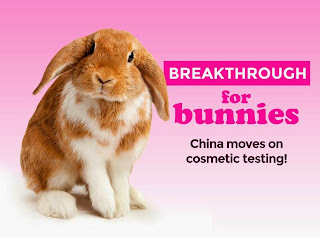 It is estimated that 30,000 rabbits, mice and other animals may be subject to cosmetics chemical testing each year in China alone so this is a massive step forward in ending animal testing and will hopefully set a precedent for other countries who continue to cruelly test products on animals prior to retail sale and human consumption. “This news from China marks a major milestone in our campaign and could constitute a significant watershed moment in our global effort to end cosmetics animal testing worldwide. HSI's team has prioritised efforts to transform the future for animals in laboratories in China. This development is only the beginning of what we hope to be a paradigm shift towards 21st-century science without animals." - Troy Seidle, Director of Human Society International Be Cruelty-Free campaign. A recent poll conducted by Human Society International showed that 88.9 per cent of New Zealanders support a ban on cosmetics testing on animals. I love that there are changes being made internationally to the cosmetic industry!